When the Louisville International Airport wanted to extend the runway so they could put in an Engineered Materials Arresting System (EMAS), they ran into a literal roadblock. There was a security access road running right through the location where they needed to make the extension, and there wasn’t any space to move the road, or utilities back. They needed this EMAS to make it possible, and safer, for larger jets to land. The system would work as an added precaution to help slow down the jets if they were unable to stop on their own, and it would protect the passengers and limit the damage done to the plane. To make the pedestrian bridge a reality, retaining walls were required to raise grade for the bridge to span over 146th street. The engineers from HNTB decided that the best solution would be to build a tunnel so the security access road could drive under the runway, which gave room for the expansion. To do this, they designed four different retaining walls that lead up to the tunnel, with each wall posing it’s own challenges. HNTB was the specifying engineer who had originally specified a pile and lagging wall, or an option for small segmental blocks. Mike Mattingly, PE, from Mattingly Engineers, said that Redi-Rock® was the final choice because the price was significantly less, it would take less time for the installation, and because of the versatility of the Redi-Rock system. Redi-Rock is a precast, large block retaining wall system that stacks together like giant Legos using a knob and groove design. Redi-Rock offers a variety of products, including gravity and reinforced blocks that can be used together, allowing designers to build walls in the safest, most efficient ways possible. Engineers had several issues to consider as they began designing the walls for this project. According to Mattingly, sloping bedrock, utility duct banks, a utility manhole, and a tight construction schedule were all challenges they had to work through as the project progressed. Redi-Rock of Kentuckiana was hired to produce and install the blocks for this project, and they did it faster than the allotted time, even with the different setbacks that came up. 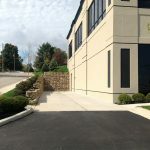 “Installation was a very time critical situation…I originally gave them a time frame of 35 working days to get this job up and completed; we got it done in 23 days,” said Irvin Vittitow, Co-Owner of Redi-Rock of Kentuckiana. Vittitow said the the biggest problem they faced in the project was with a duct bank that was in the backfill area, which couldn’t be disturbed because it helped run United Parcel Service’s (UPS) ground operations. Since the duct bank was in the way of the excavation area for the geogrid, they decided to put up a temporary shoring wall, but it ended up being a permanent wall because of complications that pushed into the area where they could put reinforcement. To solve this problem, Vittitow and Mattingly decided it would be acceptable to make a portion of the wall with gravity blocks, and then backfilled with concrete for added support. One of the major reasons why Redi-Rock of Kentuckiana was able to install the wall so quickly was because of their incredible use of a Towtem grapple. The grapple is able to pick up the blocks and place them on the wall in the proper location in less than 30 seconds per block. This also eliminates the need for a man on the ground or on the wall, hooking and unhooking blocks. Vittitow said that they were able to cut out approximately one to two men, which saved them money in the end. The base course is set with a traditional chain and excavator hook up so they could ensure that the bottom course is perfectly level, said Vittitow. The project included four gravity and Positive Connection (PC) walls, which equalled approximately 20,943 square feet (1945.7 square meters) of wall face, and 385 Redi-Rock caps to give the walls a more finished look. The walls each led up to the tunnel that runs under the area where the EMAS blocks were installed. The wall engineer was able to incorporate multiple types of Redi-Rock blocks throughout the project design, all in the Limestone face texture, which gave the walls a beautiful, cohesive look. “In the end, to accommodate all of the various site and project constraints, six different typical sections were developed and used. These included a gravity system…in a soil retained zone; a gravity system using 28″ blocks and cast-in-place concrete backfill; a gravity system in front of a (sheet piling to protect the manhole) per AASHTO; a reinforced system with a soil retained zone; a reinforced system with a soil and rock retained zone; and a reinforced system with a rock retained zone and a (sheet pile),” said Mattingly. 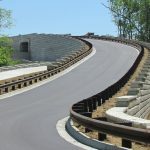 According to Mattingly, all of the walls were designed in accordance to AASHTO LRFD 2012, and the gravity sections were analyzed with the Redi-Rock Wall Analysis Software, while the reinforced sections were analyzed with MSEW software. “This project showed that with a little creativity, the options for solving complex situations are unlimited,” said Mattingly. This project was the recipient of the 2015 Rocky Award for “Commercial Application Wall of the Year” from Redi-Rock International. The Rocky Awards are an annual honor recognizing the best Redi-Rock projects completed each year across the globe. Reinforced Retaining Wall Blocks – Build reinforced retaining walls with the revolutionary Redi-Rock the Positive Connection (PC) System. Redi-Rock Accessories – Steps, Caps, and Columns coordinate with Redi-Rock retaining wall products to give your project a cohesive look. Limestone Blocks – Redi-Rock Limestone blocks mimic the texture of natural split Limestone.